The Battle Against Campylobacter – Are We Winning? Consumer research by the UK’s Food Standards Agency (FSA) released in August showed that show that two thirds of consumers think the industry should continue to reduce Campylobacter levels beyond the agreed current target of less than 10 per cent of chickens at the most highly contaminated level. This research has again thrown out a challenge to the poultry industry: has enough been done to reduce the risks from Campylobacter? Poultry consultant Jeremy Hall gives his views. It is certainly a fact that the food-borne illnesses associated with the many bacteria species classified under the genus Campylobacter and their risk to consumers are still present, even though changes in data gathering methods have left us with a poor picture of how today’s levels of illness compare with previous years. What we are aware of is the actions being taken by the poultry industry to reduce the levels of harmful bacteria arriving on retailers’ shelves, in both whole birds or portions and cuts. The industry has, however, taken some decisive action. Removing the neck flaps from the whole bird carcass – one area that carries very high counts of Campylobacter, often up to 50,000 per gram of skin – has made a positive step forward in reducing the loading. But the other steps the industry has taken, while showing some promise, have so far been unable to deliver chicken carcasses or portions that present virtually no risk to the purchaser. Effective heat treatments will help, be they hot treatments or alternatively very cold treatments, but few have introduced these measures. A chicken flock in the height of summer will have some flocks carrying between 10,000 and 100,000 Campylobacter at the end of the evisceration or drawing process, and during chilling. In this case it is not surprising that around 65 to 70 per cent of all carcasses remain positive for Campylobacter at the end of the packing process. We researchers know – and retailers are also aware – that from October to the end of February levels of Campylobacter decline in most flocks and some will be virtually free of the bacteria. However some will always be Campylobacter-positive and consumers with poor kitchen hygiene habits or who are susceptible to Campylobacter infection will still become hospital statistics. Campylobacter-control legislation has been proposed for all EU member states, including the UK, that will set a maximum permitted level present in chickens sold at retail. If the regulation is approved, however, it will cause huge difficulty as few member states will be able to deliver this standard during the warmer months, and many will struggle even in cooler parts of the year. Either the legislation will need to be watered down, with the testing method standardised to ensure the majority of producers comply, or the proposal must be kicked into the long grass until effective reduction can deliver suitable results throughout the year. There was a time when I wondered whether retailers were afraid of added costs of Campylobacter reduction for retail products, but they agreed to look at cook-in-the-bag roaster bags, most of which are very costly. Consumers accepted the costs, bought the product and then set about tearing off the roaster bag as they feared packaging in an oven was a health risk. Or else they felt they had always cooked a chicken according to guidance from Delia or other cooks without any problems. Some used the roaster bags, reducing the danger from Campylobacter, but up to 40 per cent removed them. 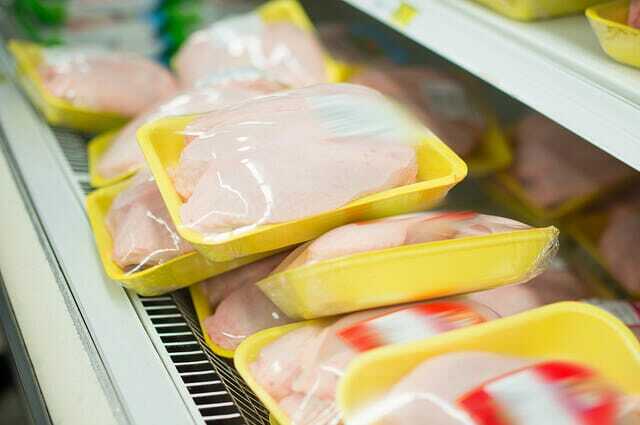 As whole birds account for only 30 per cent of the chicken sold in the UK, these measures still leave the majority of skin-on chicken portion packs on sale and potentially highly infected, sometimes containing levels of Campylobacter that are similar to those found on neck flaps. Well-run and controlled steam processes are helpful, but to remove Campylobacter they need a fairly long exposure time. This discolours the skin and consumers may be unhappy with this option. Use of hot-water sprays or dip tanks prior to the evisceration process cannot stop re-contamination during evisceration; as such they will also offer only limited benefits, but it is better than no action at all. The recent consumer research by the FSA stated that “consumers feel the industry and retailers have not done enough to deliver consumers a safe chicken in retail outlets”. Sadly, from a consumer’s point of view this is true, but the industry has taken action on farms, in improved catching methods and via a number of initiatives in the slaughter and processing plants. Unfortunately, this has not delivered a reliably safe chicken pack in all seasons. Further actions involving additional heat treatments, or cold treatments, will be needed, and multiple interventions will steadily drive down the levels of infection. But this is going to cost the industry and consumers at the checkout. The industry leaders who have worked with the FSA for the last ten years, and more recently the retailers too, have certainly attended many meetings, and pledged to work together towards Campylobacter reduction. To a fair degree this has delivered some improvements, but as yet not enough. Consumers cannot see why the foods they purchase from all the major retailers still pose a risk to their families’ health. Our industry continues to grow and deliver low-cost and low-fat meats, for consumers who look for food safety, and healthier and cheaper products. If we cannot come up with a process in the industry that delivers long-term answers to consumer fears and concerns, we may find one day that a food scare from has wrecked the public’s faith in our primary raw material. Retailers will not be hurt by such bad-news stories, as consumers will simply buy another product instead. So the lead needs to come from the FSA, legislation, consumers and the industry. Retailers will still be making profits from other meat lines and ranges. Consumers need to use their purchasing power to show retailers how much they want a supermarket in which they can purchase really safe chicken meats, and supermarkets that deliver on this could really gain a competitive edge. Read more from Jeremy Hall by clicking here.